My favorite session that I attended at this year's ACR Annual Meeting was a session by Dr. Iain McInnes of Glasgow titled "Treatment of Rheumatoid Arthritis When the Patient is Not Well." Arriving a few minutes late, I walked in to hear the words of a passionate (and humorous!) Scottish rheumatologist whose every word resounded with the truth RPF has been proclaiming: this is a systemic disease and each of the "multi-morbidities" (as he called them) must be recognized and treated as a part of the disease itself. Touching on cardiovascular risks, rheumatoid lung disease and even depression -- Dr. McInnes emphasized that each component must be measured, must be addressed-- "or the patient will die". It may sound dramatic, but the truth is that despite advances in treatment, the mortality rate of RD has not changed in recent years. Until we begin screening for and addressing other manifestations of rheumatoid disease, that statistic is not likely to improve. 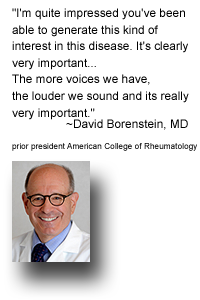 We had the opportunity to talk with Dr. McInnes after his session and to thank him for speaking on this topic and sharing these simple yet important truths with other rheumatologists. If every rheumatologist practiced the way Dr. McInnes preached, the landscape would be completely different. There are a lot of great doctors in the U.S. and around the world who do take these things to heart, and we had the opportunity to meet many of them at ACR. While some doctors are still stuck in their own ways or have a hard time implementing proper guidelines due to time constraints and other pressures, we are hearing a powerful message that emphasizes measuring and treating the whole disease and working with the PRD to provide the best possible care and outcomes. It is this message that we want to continue to spread, and we hope to open the conversation so that we can overcome challenges to proper patient care. 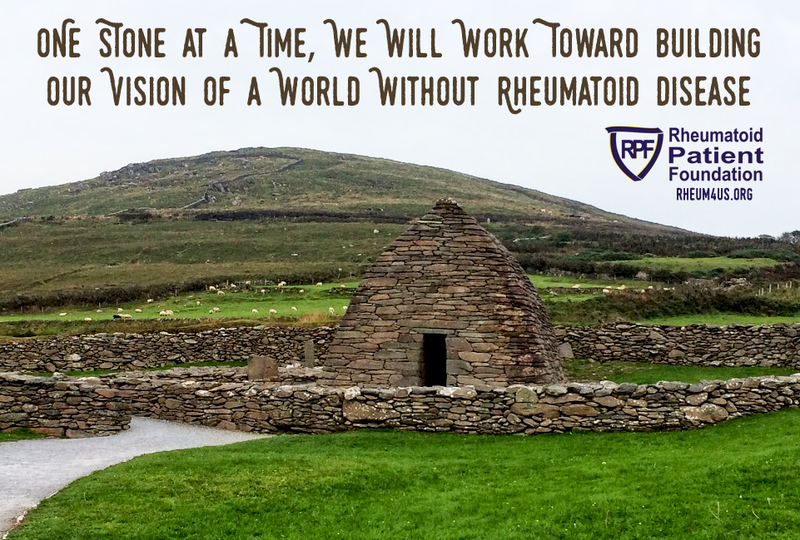 Since its inception, RPF has been focused on changing the landscape of Rheumatoid Disease. We want things to look different -- better care, more effective treatments, better awareness, education & understanding -- and one day, a cure. Sometimes it may seem overwhelming, as there is so much work yet to do. But, as with any large-scale project, all we need to do is move one stone at a time. Working together, we can provide a better outlook for PRD, and one stone at a time we will work toward building our vision of a world without Rheumatoid Disease. This year's event is scheduled for this coming weekend in Washington, D.C. and is expected to bring in over 16,000 rheumatology professionals -- doctors, nurses, researchers and more -- from around the globe. RPF will have a couple of representatives at this year's Annual Meeting to attend the scientific sessions and connect with healthcare and industry professionals in an effort to further our mission. Stay tuned for blog updates on new research and learnings -- plus, be sure to follow us on Twitter for live tweets during the event! 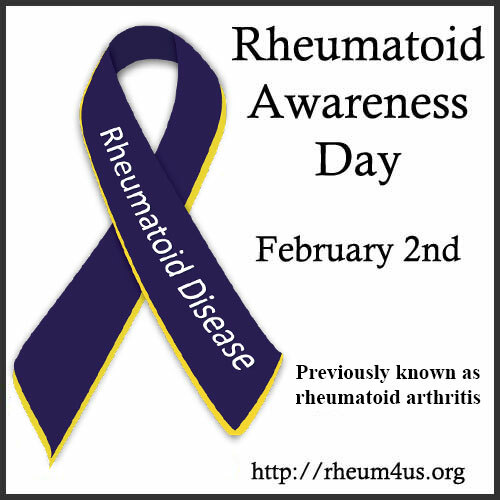 February 2nd marks the fourth annual Rheumatoid Awareness Day -- established by RPF in 2013 as a way to spread facts and increase awareness of what rheumatoid disease really is. With so many misconceptions and myths perpetuated by the media, and with a common name of rheumatoid "arthritis," it can be difficult to break through with the truth about RD. For Rheumatoid Awareness Day this year, we have chosen seven facts to help show the world what The Real Rheumatoid Disease looks like -- not the way it's portrayed on TV ads or in the media -- but what it's like for real people. To that end, we are challenging you to help us show #TheRealRD to the world. We've included the facts below along with simple images that can be easily shared on social media. Help us spread the word and use the hashtag #TheRealRD when posting on social media. The Real RD Blog Challenge! 1. Rheumatoid Disease is not a type of arthritis; arthritis is just one symptom. RD is a systemic disease related to immune function that can affect any part of the body including the heart, lungs, eyes, skin or joints. 2. 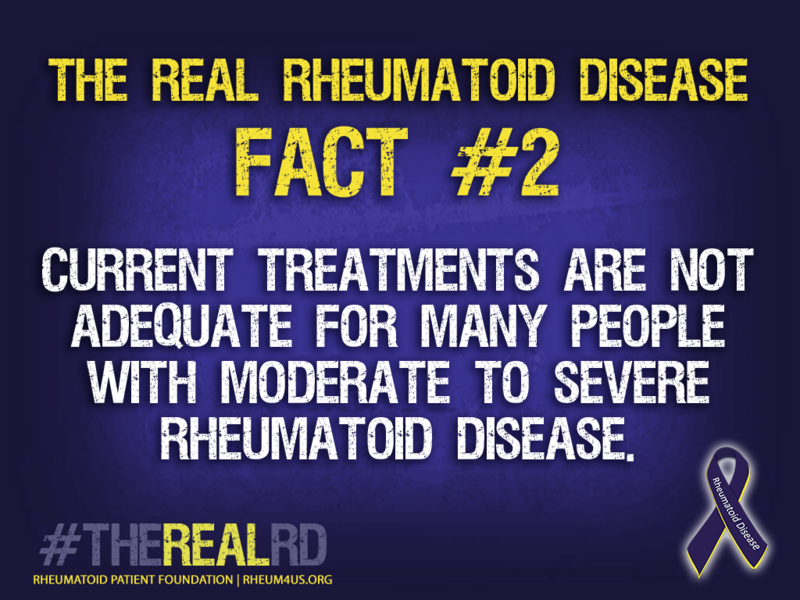 Available treatments are not adequate for many people with moderate to severe Rheumatoid Disease. About 1/3 of patients don't respond to available biological disease modifying drugs. 3. Rheumatoid Disease is different in each person -- and even in the same person over time. Some people experience constant pain; some have a series of "flares" and periods of lower disease activity. Symptoms can vary greatly from day to day. 4. RA Research is severely underfunded in the U.S.
RD is funded at about 1/12th the per-patient rate of similar diseases with comparable impact. 5. 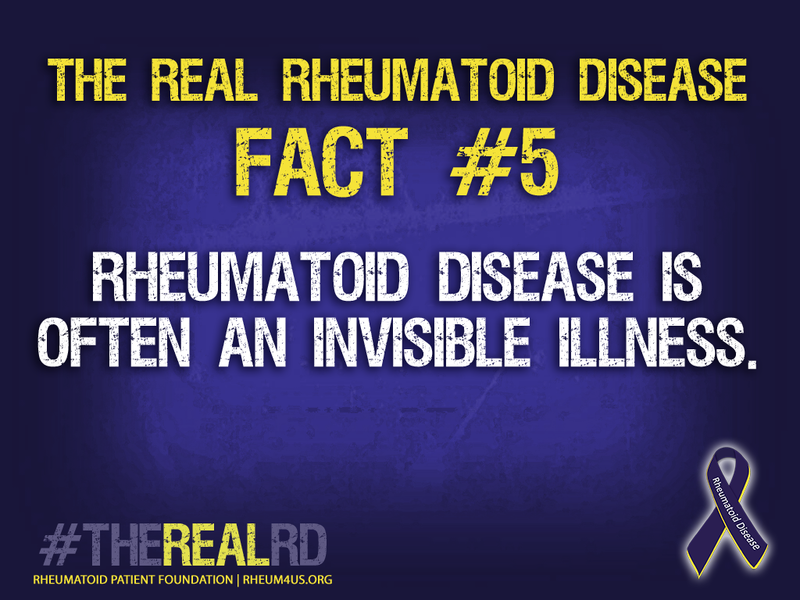 Rheumatoid Disease is often an invisible illness. Just because someone with RD looks good doesn't mean he or she feels good. 6. Early, aggressive disease treatment has been shown to provide the best outcomes. Those whose disease has been treated early have the best chance at achieving remission or low disease activity. 7. Remission is rare. Pain is not. Remission rates have been reported as low as 6% in the average clinical environment. Most people with RD experience pain every day. In honor of the New Year and the upcoming annual Rheumatoid Awareness Day, I'd like to challenge everyone with 15 ways YOU can help spread awareness of Rheumatoid Disease in 2015. Get involved in time for Rheumatoid Awareness Day on February 2nd, and see how many of these you can complete by the end of the year! We've created a whole gallery of images that you can share to spread awareness just through your social media profiles. Share an image on Facebook, Twitter or Instagram. Click here to choose from any of ours, or create your own! Visit our store to pick up awareness merchandise for Rheumatoid Awareness Day or all year round! Or, simply put in Indigo and Gold in support of Rheumatoid Disease. RPF Members -- don't forget to wear your pins! Click here to add a virtual Rheumatoid Disease awareness ribbon to your social media avatars through the Twibbon website. Use one of our Facebook Cover images to help spread awareness, or create your own image! 5. 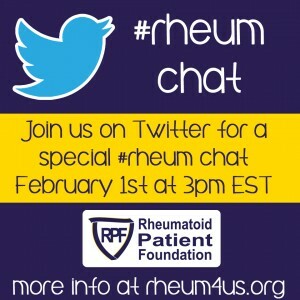 Join #Rheum Chat - Special Chat to be Hosted February 1st at 3pm! Follow the hashtag #rheum on Twitter to join in conversation about rheumatoid disease with other patients, caregivers, healthcare providers and industry professionals. It's a great spot to connect with others for encouragement and asking questions! Join us for a special #rheum chat prior to Rheumatoid Awareness day -- on Sunday, February 1st at 3pm. Click here for details. RPF Members may have received some Awareness Cards in their membership kits, but we also have a digital version that you can print out or share online. 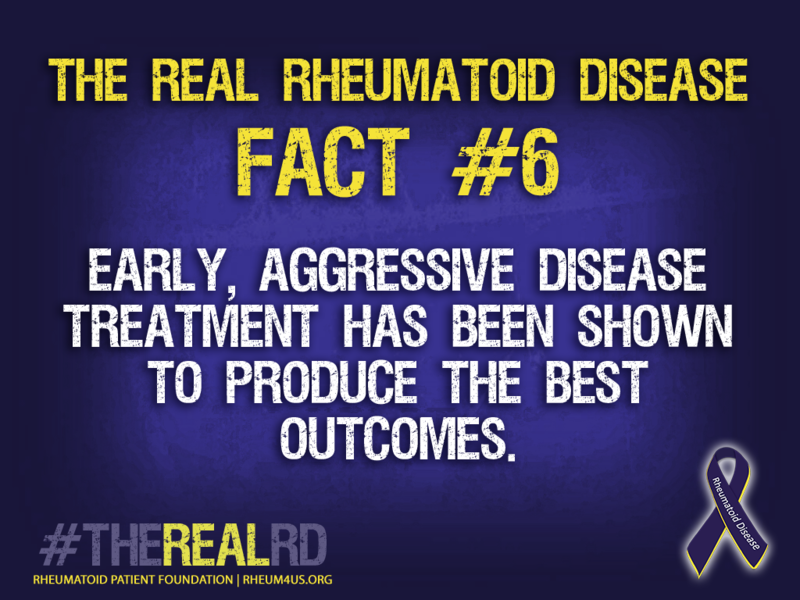 These few simple facts about Rheumatoid Disease can help set the record straight! Keep one in your purse or wallet as an easy reference when somebody asks you about RD. Click here to download a PDF. Several RPF Members have already worked with their local governments to get an official proclamation for Rheumatoid Awareness Day on February 2nd. This can make a big impact on a community and may even attract the attention of local press. Read stories from other patient advocates here and here, or click here to get tips on how to be an advocate. Your own story is so important. Sharing your experience with Rheumatoid Disease and how it has affected your life can go a long ways to create awareness and understanding of this illness. If you want to take it a step further, share your story online -- contact us and we'll post your story on our blog! 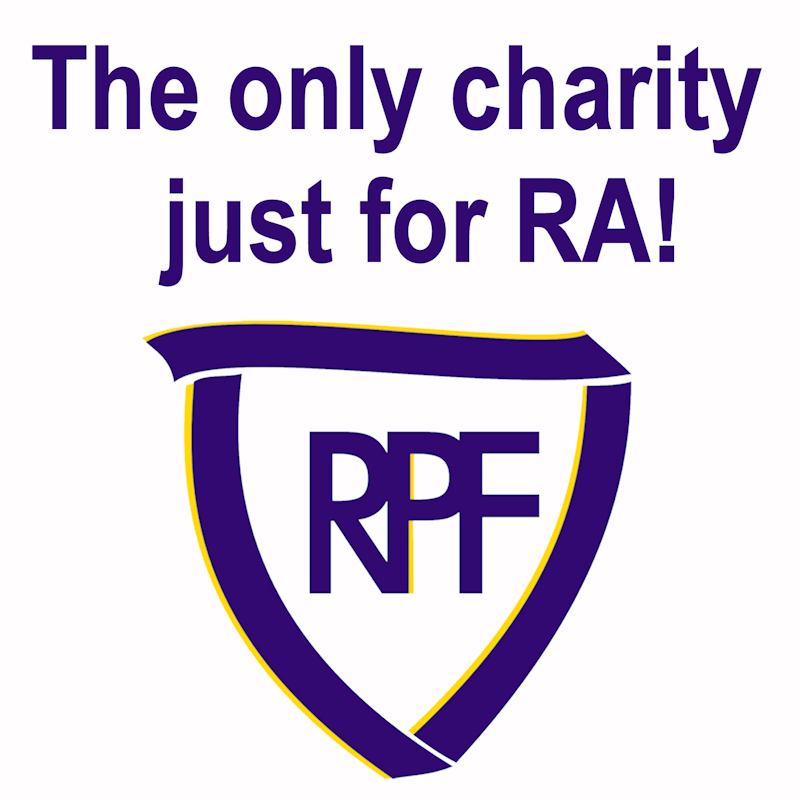 Become a Member of RPF and help support our mission of improving the lives of people with Rheumatoid Disease. Your support helps us extend our reach! Several individuals and corporations have teamed up with RPF to offer additional support through corporate donations or by donating a portion of merchandise sales. Visit our Partners page to learn more. This year, for Rheumatoid Awareness Day, we are encouraging individuals to shoot a simple 15 second video telling the world why we need a cure for Rheumatoid Disease. Post the video online and ask your friends and family to share it -- or create their own! 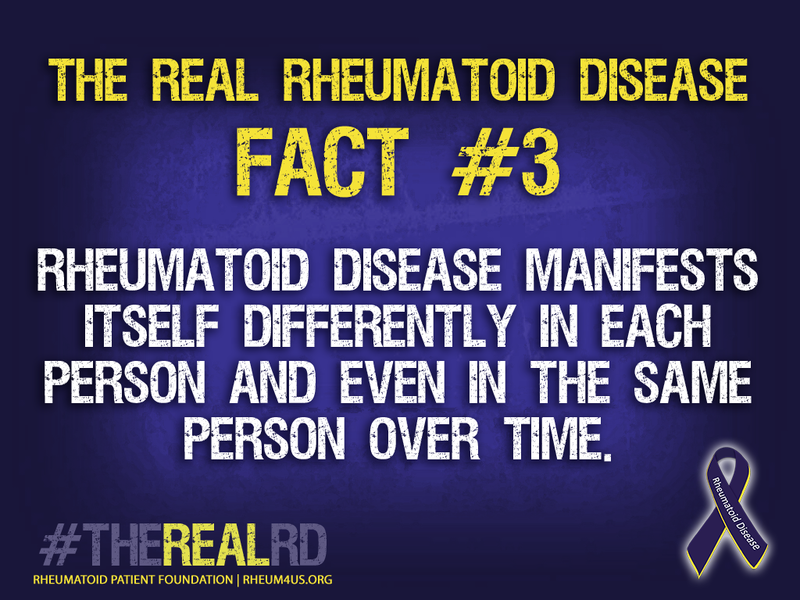 Read more about the Rheumatoid Awareness Video Challenge here. Keeping sharp on your own knowledge of Rheumatoid Disease is one of the best ways that you can spread awareness and accurate information to others. Click here for a list of key resources to learn more. Use your creativity to plan and host a unique fundraising event! RPF members have done fundraising through selling merchandise, doing a race and even a paddle boarding event! The sky is the limit -- create an event that suits you and your friends and family. Contact us with your idea, and RPF will help you promote and support the event. As RPF creates new images and publications, we are always looking for patient photos to use instead of stock images. We want to show the true faces of Rheumatoid Disease. Consider donating a photo for use by RPF. Click here to donate. There's not much to celebrate as relates to Rheumatoid Disease, but awareness and public education is something to get excited about! Host your own Awareness Day event and do something fun. Click here to send us photos and a description of your celebration and we'll post it on our blog! There you have it. 15 ways to get involved and spread awareness for Rheumatoid Disease in 2015! Each of us has a sphere of influence. Combined, we have the ability to reach so many people with the truth of Rheumatoid Disease in order to create a better understanding of what people with Rheumatoid Disease live with, to boost research funding, to encourage better care and accommodation, and to bring hope to others by letting them know they are not alone. Pick one of the above, pick 5, or pick them all -- every little bit helps! Together, we can do more! As we get ready for the 3rd Annual Rheumatoid Awareness Day on February 2nd, I want to challenge EVERYONE to create a simple video -- even as short as 15 seconds -- telling the world why we need to find a cure for Rheumatoid Disease. Rheumatoid Disease is estimated to affect about 1 out of every 100 people, so chances are most people know someone who has it. If you have RD, if you have a relative or friend with RD, if you are a caregiver -- add your voice now, tell the world why you want to see a cure, and help give Rheumatoid Disease 15 seconds of fame in 2015! Share your video online and ask your friends and family to share your video and/or create their own! Use the hashtag #Rheum4ACure so we can find and follow what others are posting. Here's a peek at my sample video (a little longer than 15 seconds, but yours doesn't have to be!). Join us for a special Twitter chat TODAY, SATURDAY, FEBRUARY 1 at 10AM Eastern Time. Simply tag your tweets with the hashtag "#rheum" to join in! If you're not on Twitter, you can still follow the conversation by clicking here. 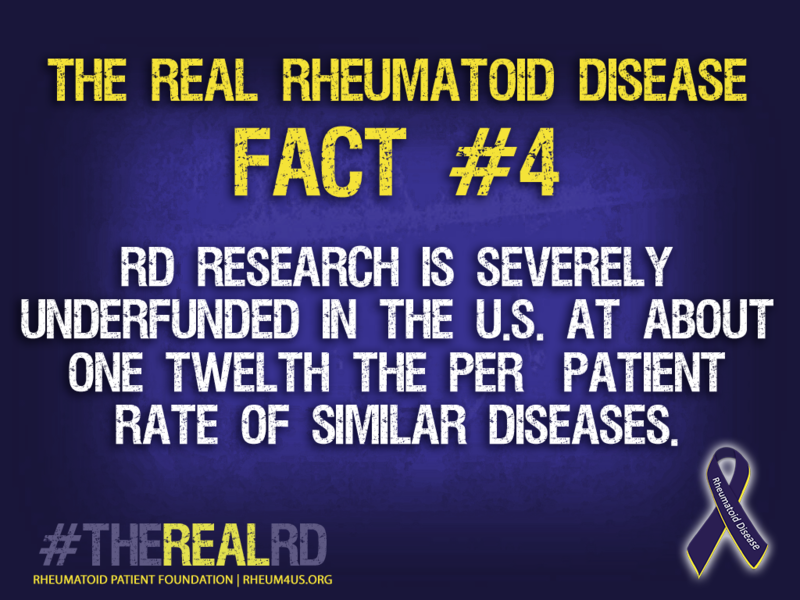 Q1: What is the one thing you want people to know about Rheumatoid Disease (RD)? Q2: What is the biggest impact RD has on patients? Caregivers? Q3: How would greater awareness for Rheumatoid Disease impact people's lives? Q4: What is the biggest challenge to awareness for RD? Q5: What is the most important question for RD research? Q6: What is one thing you can do to educate or bring awareness in your sphere of influence? This live chat event is an opportunity to come together from different perspectives and locations for RD awareness. If you are a patient or caregiver or work to help patients, we hope you can join in! Don't forget, RPF is also hosting a live chat on Facebook with Mayo Clinic rheumatologist Dr. John Davis on Sunday, February 2nd at 11am ET. Click here to join the Facebook Event. More ways to get involved in Rheumatoid Awareness Day events - click here. January 27, 2014 – Thousands of patients are joining an international movement to increase awareness for the chronic illness known as rheumatoid arthritis, or rheumatoid disease, in anticipation of the second annual Rheumatoid Awareness Day on February 2. Rheumatoid Awareness Day was established in 2013 by the Rheumatoid Patient Foundation (RPF) to address the lack of awareness for rheumatoid arthritis — often presumed to be a type of arthritis — and resulting inadequacies in disability accommodations, clinical care, healthcare costs and research funding. 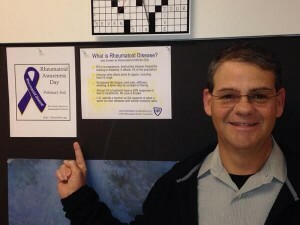 RPF is encouraging individuals and organizations to get involved in the 2014 Rheumatoid Awareness Day by joining the Facebook event created for the day; participating in an online chat on February 2, with Mayo Clinic rheumatologist Dr. John Davis; sharing awareness images and education resources; and creating their own awareness events. RPF is asking participants to share what rheumatoid awareness means to them and to show how they are celebrating awareness by posting photos and personal blogs. Additionally, Crescendo Bioscience is providing a matching grant for donations to RPF, up to $15,000. Crescendo Bioscience provides quantitative molecular tests and disease information services in the field of rheumatology; it’s initial product is Vectra® DA, the multi-biomarker blood test for rheumatoid arthritis. 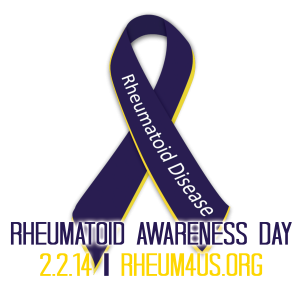 More information about Rheumatoid Awareness Day and how to be involved can be found at http://rheum4us.org. Rheumatoid arthritis is a progressive inflammatory disease causing damage to joint and organ tissues, resulting in severe pain, frequent disability, and increased mortality. For most patients, current treatments neither relieve all symptoms nor assure a healthy future. Remission is rare. Rheumatoid disease affects about one percent of the world’s population, and Mayo Clinic says lifetime risk of the disease is 3.6 percent for women and 1.7 percent for men. RPF is a 501c(3) non-profit organization dedicated to improving the lives of people with rheumatoid diseases such as rheumatoid arthritis and juvenile arthritis. RPF was founded in 2011 to address a significant lack of disease education, comparatively low levels of research funding, and difficulty obtaining adequate treatment. RPF is committed to creating pathways to better clinical care and disease outcomes through education, awareness, and participation in patient-centered research. 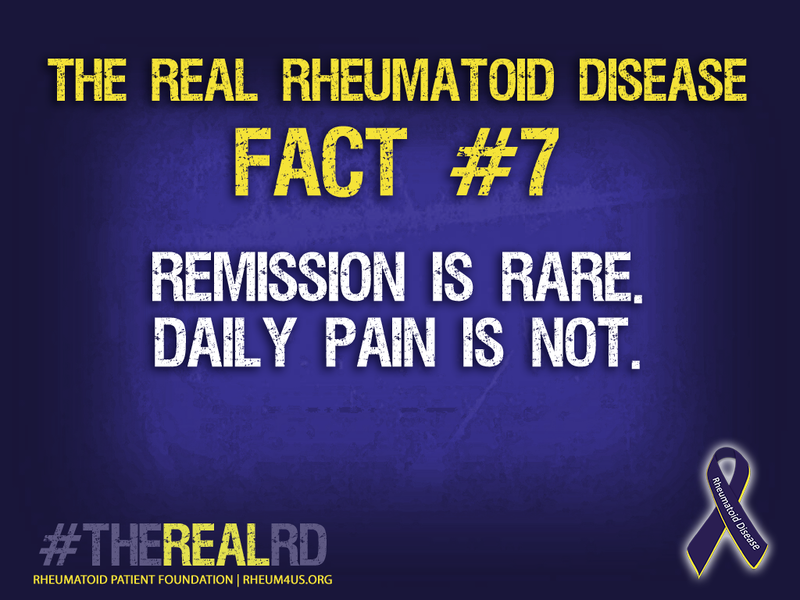 For more information, visit http://rheum4us.org or follow RPF on Facebook or Twitter. Show Us How You Celebrate Awareness! Click here to read more highlights from the inaugural Rheumatoid Awareness Day. This year, we want to see how YOU celebrate awareness! 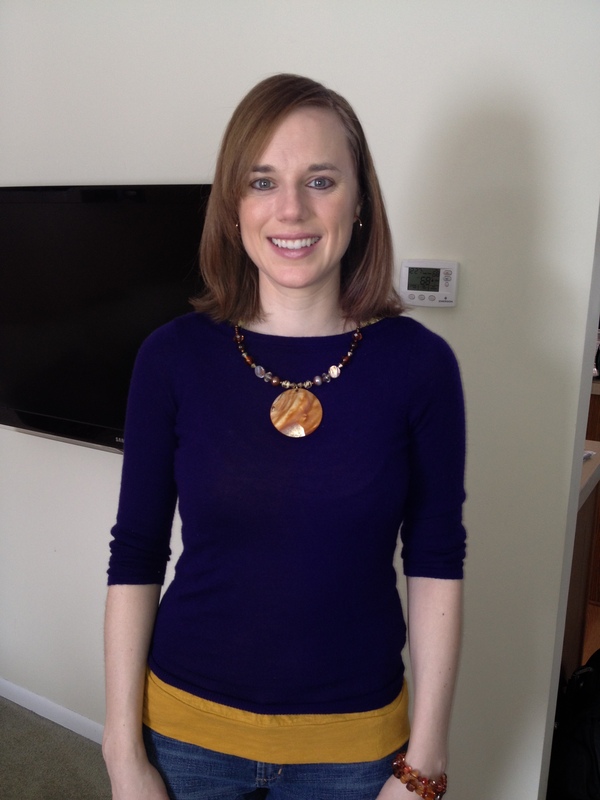 Send us your photos from Rheumatoid Awareness Day showing how you are participating. If you're doing something big or unique, send us a paragraph about what you are planning and we'll post it on our blog. Imagine how encouraging it will be to see all of the different ways that people are working to bring awareness. 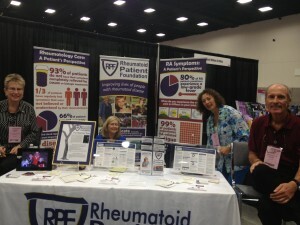 Feel free to post your photos on Twitter (tagging @RheumPF), on our Facebook page (http://facebook.com/rheumatoidpatientfoundation), or email us at dana@rheum4us.org. People with Rheumatoid Disease (PRD) often feel alone and misunderstood. We want to show PRD that they are not alone, and to help the rest of the world to understand this disease. 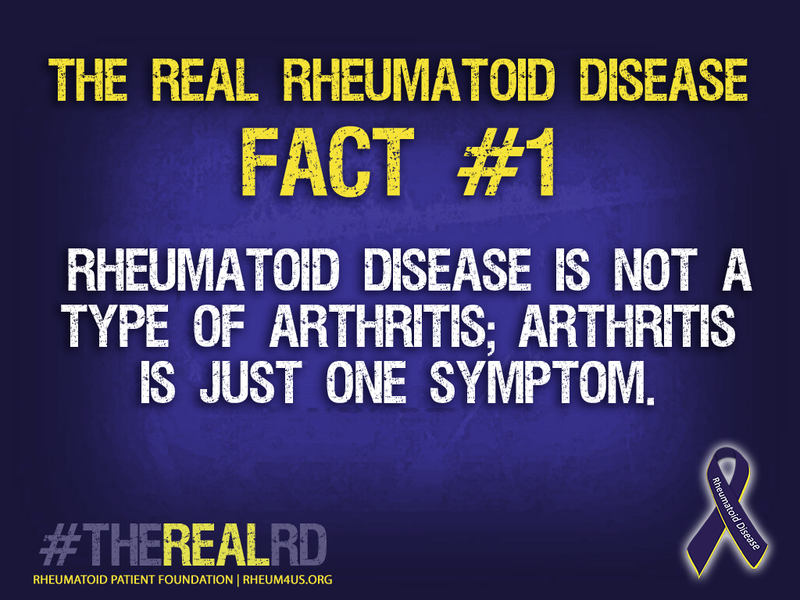 Awareness and education are the key to dispelling myths and clearing up misconceptions about rheumatoid "arthritis". Generating a greater level of awareness for rheumatoid disease can help patients be better understood by friends and family, it can make getting accommodations easier, it can help improve clinical care, and it can help generate additional research funding. And, for us, those are all things to celebrate! This February 2nd -- between the Big Game and the ever alluring reveal of the Groundhog -- remember: together, we can do more! Let's party! Comments Off on Show Us How You Celebrate Awareness! 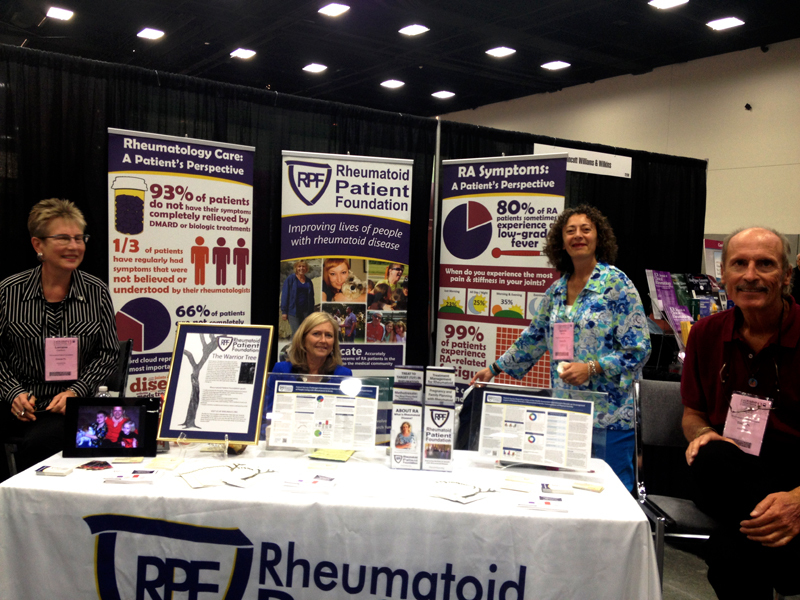 Last month was the third year that the Rheumatoid Patient Foundation attended the American College of Rheumatology (ACR) Annual Meeting. According to ACR, this was the third largest meeting in their history, attracting nearly 15,000 doctors, health professionals and others interested in rheumatology. You’ll be hearing reports from several of our volunteers over the coming weeks, but I wanted to share an overview of RPF’s experience and presence at ACR this year. This was our third year exhibiting at ACR. As in the past, we had a booth space in the Exhibit Hall staffed by a wonderful group of volunteers. The Exhibit Booth was a great opportunity for us to create awareness of our organization, share the mission and goals of RPF, and provide information about the resources we have available for health professionals. We had samples of all six of our educational brochures, including our two new ones about Methotrexate and Treat to Target. Our volunteers also had the opportunity to engage in conversation with clinicians and other health professionals, sharing information from the patient’s perspective. We received a lot of encouraging feedback – from those who were already familiar with RPF and our work, but also from those who learned about our organization for the first time. Each day of the Annual Meeting, there are educational sessions that run from early morning into the evening, covering a wide range of topics in rheumatology. Our volunteers were able to attend several of these sessions, and they’ll be sharing what they learned and experienced through that. This year, RPF broke new ground by having our own speaking session at the Annual Meeting. RPF Founder and President, Kelly Young, had a vision of presenting on the topic of Patient Engagement at ACR, but there was a lot of work and steps to take to make that happen. At the end of last year, RPF created a session proposal outlining the topics and learning objectives we wanted to cover and submitted it to ACR. After review from the session committee, our proposal was accepted as a session with the American Rheumatology Health Professionals (ARHP). Kelly had strategically identified three key speakers to participate: Dr. Jeffrey Curtis (rheumatologist and RPF advisory board member), Elizabeth Riggs, PhD (registered nurse, RA patient, and RPF member), and Kelly Young herself (as the founder of RAWarrior.com, RPF and as an “experienced” RA patient). These three individuals combined to make a very powerful panel of speakers, each with their own unique credentials. 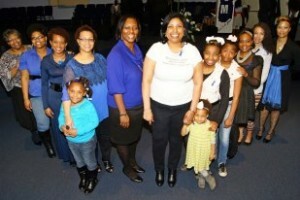 The ARHP Session was held on Tuesday afternoon. Despite being later in the day and later in the Meeting, the session room was filled! Dr. Curtis spoke first on using Patient Reported Outcomes in clinical practice and the importance of doctors partnering with patients to create what he called a “therapeutic alliance.” His expert knowledge, experience, and wit came together to create a very engaging talk. Elizabeth Riggs spoke next on Overcoming Obstacles to Shared Decision Making and she proclaimed a rheumatology appointment as truly a meeting between two experts: the doctor and the patient. Elizabeth used her experience as a health professional, her experience as a patient, her humor and her unabashed conviction to open the eyes of the attendees to the truth of this “vile disease”. Finally, Kelly Young spoke about Engaging Patients as Partners, dispelling myths about rheumatoid disease and exposing the truth about what patients experience. Her passion and her dedication shone through as she gave example after example of unrecognized truths about rheumatoid disease. Her talk served as a powerful anchor for the session, opening the eyes of the audience and landing on the crucial importance of involving patients in their own care. There was a full crowd in the session room, and I am sure that not a single person left there unaffected by what they heard. The impact these talks made was evident from the feedback and interest of the attendees – and it gave many of them pause to consider how they can better partner with their own patients. Look for more details and video from this session coming soon. 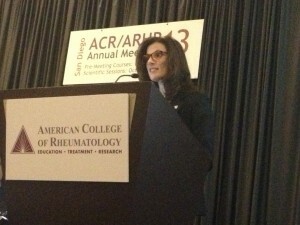 Another ground-breaking thing happened at ACR this year: RPF submitted two research abstracts that were accepted by ACR for poster presentations and publication in a supplement of the October issue of Arthritis & Rheumatism (online only), an official journal of the American College of Rheumatology. Each day of the ACR Annual Meeting there is a GIANT room filled with hundreds of research abstracts printed on oversized posters. 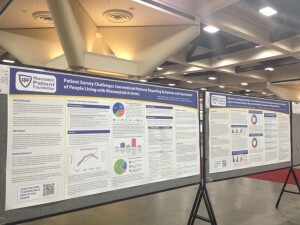 RPF presented two posters on Tuesday, based on survey data collected from our own patient community. Click below to download a copy of each of the posters. We received a lot of positive feedback during our poster presentations, with many doctors recognizing the importance of our work. We left the ACR Annual Meeting (literally the last ones out of the building!) on a very high note, not with a sense of completion, but with a sense of momentum – looking forward to the next steps for continued research and education aimed at improving quality of care for people with rheumatoid disease.